When Lek (Xavier Tchili) leaves his neglectful, poverty-stricken home, aged just four, he learns how to survive by finding a family within a pack of wild dogs. Found on the streets, Lek is eventually brought back into human society. However, his early experiences never leave him. Part docu-drama, part cinematic art installation, Andrew Kotting’s unsettling film is fascinating and thought provoking. A challenging movie that I appreciated more than wholeheartedly enjoyed, Lek And The Dogs is a stunning visual and aural experience. Based on the award-winning play by Hattie Naylor, Kotting’s skillful film examines the true story of Ivan Mishukov (who the director renames Lek), who walked out of his Moscow apartment at the age of four and spent two years living on the city streets where he was adopted by a pack of wild dogs. We first see Lek (powerfully portrayed by Xavier Tchili) in what could be a post-apocalyptic world. However, his isolation may also be self-imposed. 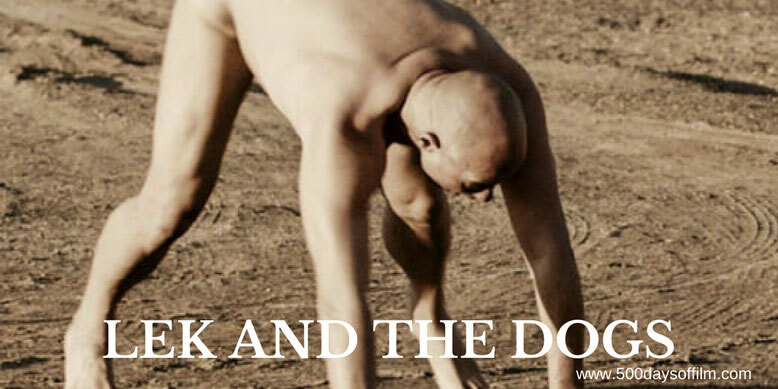 Part human, part beast, he is naked and on all fours in the desert - obviously in a state of some distress. Despite his trauma, Lek is willing to tell us his story - and it is a heartbreaking tale. His life - a journey of neglect and abandonment, betrayal and loss - is told via his own recollections (in Russian) and snatches of audio (and static sound) from his past. Meanwhile, we hear analysis of Lek’s mental and physical state from unseen English speaking (and rather pretentious) “professionals”. Lek’s story is punctuated by a series of startling (often visually stunning) shots and disorientating archive footage. Lek is diagnosed with a “disrupted mind” and this could well describe Kotting’s film itself. The overall effect is extremely impressive. It is also patience-testing, overwhelming and deeply disturbing. Have you seen Lek And The Dogs? If you have, what did you think of Andrew Kotting’s film? Let me know in the comments section below or let’s chat over on Twitter. You can find me @500DaysOfFilm.